God bless Suzy Amis Cameron. If it wasn't for her annual Red Carpet Green Dress design competition, the 87th Academy Awards might have been the dullest showing of ethical fashion since the, well, 86th Academy Awards. Following a tradition that began with actress Missi Pyle in 2012, Amis Cameron—along with ESMOD International students Manon Gabard and Tingting Chen and mentor-designer Jeff Garner—painted the Oscar red carpet a brilliant shade of verdant. Peruse our slideshow to learn more about the who, what, wheres, and hows. Gina Rodriguez, breakout star of the CW hit show Jane the Virgin wore a cobalt-gblue gown designed by Red Carpet Green Dress womenswear winner Manon Gabard. Made from 100 percent Global Organic Textile Standard-certified “peace silk”—that is, silk that is harvested only after the silkmoth breaks out of its cocoon—the dress was finished off with low-impact dyes and accessorized with vintage Neil Lane jewelry, an Edie Parker clutch, and shoes from Jimmy Choo. American Sniper’s Jake McDorman cut a dapper form in a tuxedo designed by Red Carpet Green Dress menswear winner Tingting Chen. Composed of 100 percent deadstock wool, the jacket also featured a lining derived from 100 percent GOTS-certified deadstock peace silk and a logwood-dyed peace silk trim. McDorman topped—and bottomed—his ensemble with Brave GentleMan’s animal-friendly “Innovator” shoe (courtesy of NYC vegan footwear retailer MooShoes), an EkoCycle shirt made from recycled plastic bottles, and hemp boxers by Jeff Garner’s Prophetik brand. 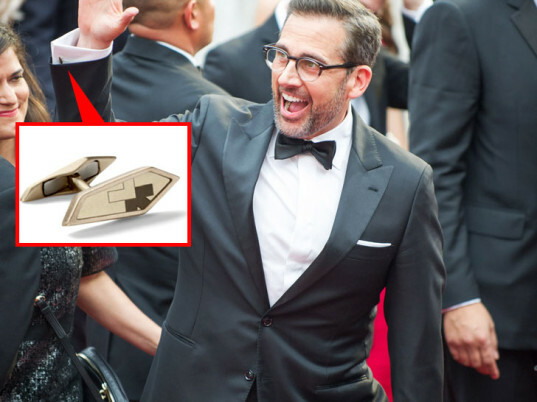 Best Actor nominee Steve Carell received a handwritten note from fellow thespian Emma Watson, who thanked the funnyman for wearing HeForShe cufflinks at the ceremony. Ethical jeweler Monique Péan created the accessories for the gender-equality campaign, which the Harry Potter actress and United Nations Women Goodwill Ambassador helped launch in September 2014. A special shoutout goes to actress Jessica Chastain, who arrived at Vanity Fair’s annual Oscar after-party in a fitted dress from H&M’s upcoming “Conscious Exclusive” collection. The frock, a PR person from H&M helpfully told us, costs $299—outside of most budgets, for sure, but a steal for Tinseltown’s finest. 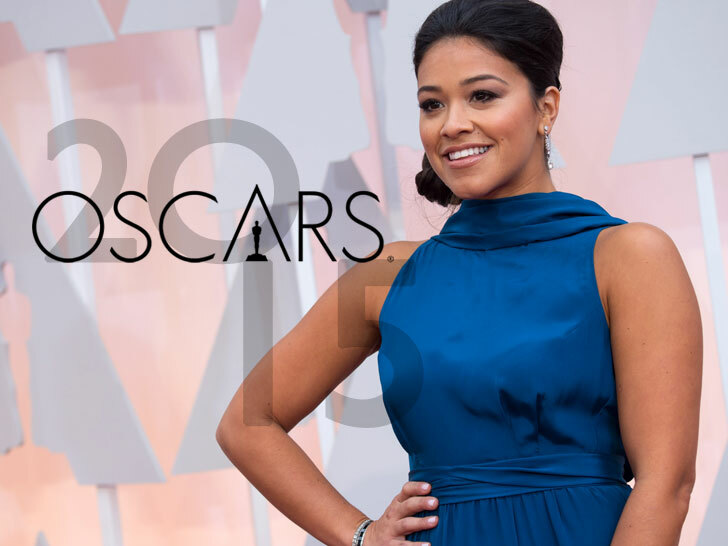 Gina Rodriguez, breakout star of the CW hit show Jane the Virgin wore a cobalt-gblue gown designed by Red Carpet Green Dress womenswear winner Manon Gabard. Made from 100 percent Global Organic Textile Standard-certified "peace silk"—that is, silk that is harvested only after the silkmoth breaks out of its cocoon—the dress was finished off with low-impact dyes and accessorized with vintage Neil Lane jewelry, an Edie Parker clutch, and shoes from Jimmy Choo. American Sniper's Jake McDorman cut a dapper form in a tuxedo designed by Red Carpet Green Dress menswear winner Tingting Chen. Composed of 100 percent deadstock wool, the jacket also featured a lining derived from 100 percent GOTS-certified deadstock peace silk and a logwood-dyed peace silk trim. McDorman topped—and bottomed—his ensemble with Brave GentleMan's animal-friendly "Innovator" shoe (courtesy of NYC vegan footwear retailer MooShoes), an EkoCycle shirt made from recycled plastic bottles, and hemp boxers by Jeff Garner's Prophetik brand. A special shoutout goes to actress Jessica Chastain, who arrived at Vanity Fair's annual Oscar after-party in a fitted dress from H&M’s upcoming "Conscious Exclusive" collection. The frock, a PR person from H&M helpfully told us, costs $299—outside of most budgets, for sure, but a steal for Tinseltown's finest.